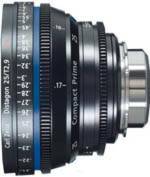 lenses in the PL mount family for digital and film cameras. complement to digital and film cameras. the rigors of life on the set. round and symmetrical over the whole T-stop range. highlights and a smooth bokeh.